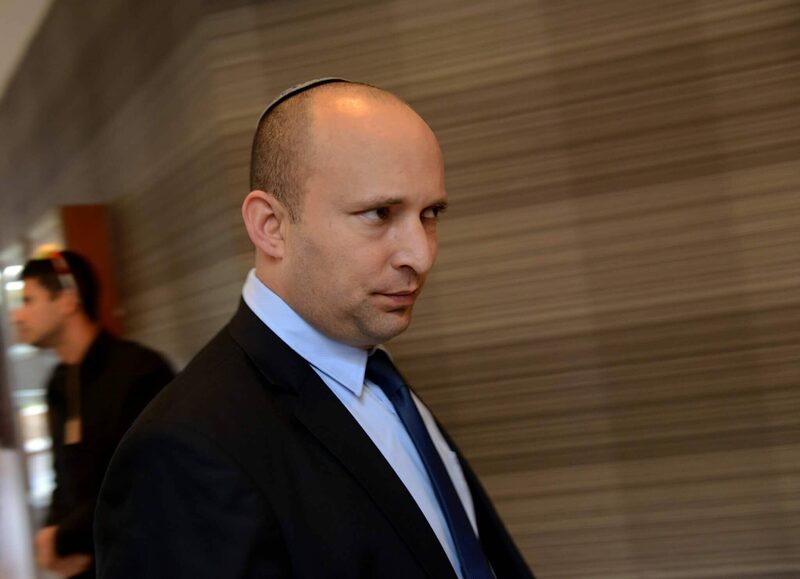 Naftali Bennett finds himself, in 2015, at a vortex of Israeli society. On one hand, Bennett, a rising star in Israeli politics and a symbol of quiet trends in Israeli society, sports a shaved head, millions in the bank, and, when speaking English, a nasal accent that sounds almost American. This Bennett has produced savvy campaign videos meant for Israel’s hip and attractive secular set. Two female members of that in-crowd are seen, in a Bennett campaign video, ready to vote for him, until, tongue in cheek, they remember the problem: the other Bennett—the right-wing one. This Naftali Bennett, who wears his knitted kippa on that shaved head, is a former chairman of the Council of Jewish Communities of Judea, Samaria, and Gaza, the umbrella lobbying-group representing Jewish settlers in the West Bank. Today, after years of political activism, Bennett has risen to head Bayit Yehudi (“Jewish Home”), a political party that he has helped to reshape but that remains the standard bearer of right-wing religious Zionism. How can Naftali Bennett manage this delicate fusion between fidelity to right-wing religious Zionism and engagement with the freewheeling Israeli mainstream? One needs to understand the dilemma from which it springs. Religious Zionism was born a century ago and drew on nineteenth-century movements that sought to combine strict Jewish religious observance with participation in modern society. Once, Europe’s rulers had walled Jews into ghettos, barring them from entering the economic or cultural mainstream. In the nineteenth century, that changed: the ghetto walls came down, liberal leaders granted Jews full legal rights, and Jews wondered how to react to this strange situation in which they were, ostensibly, equal citizens. Many answers to that challenge sprang up. The debate between these various groups is, to this day, the defining one of modern Jewish history. Some have answered that Jews should both continue to observe the religious precepts and participate in the wider society. Children should continue to be schooled in religious texts but should also receive secular training, including university education. On religious observance, there would be no compromise. But, alongside the strict religious observance, participation in modern society could be permitted. When Zionism emerged a century later, it held a natural attraction for Jews from this school. Zionism held, for the most part, that Jews should build a state of their own. In that state, Jews would neither shrink from the modern world nor assimilate into it. Rather, they would build their own institutions that would both maintain a Jewish identity and also be part of a modern, liberal international order. Rabbis saw the potential in the idea and partnered with secular (and even socialist) Zionists in building the state. At the same time, the rabbis added two twists. First, for them, the Jewish state would not be a German-speaking copy of Central Europe, as the atheist Theodor Herzl proposed, where men in top hats would attend the opera and rabbis would eschew from political power. Rather, in religious Zionism, the state would have a public and religiously-oriented Jewish identity. Second, the rabbis of religious Zionism faced a theological problem: in Jewish tradition, the climactic return to Zion happens only on the Messiah’s return. By the time of the British Mandate, Jews were coming to the Land of Israel in ever-greater numbers and seeking sovereignty. One possibility is that Jews had preempted the Messiah and thus violated Jewish law. This is the view adopted by the anti-Zionist Haredi (ultra-Orthodox) stream and, in theological terms, explains why the Haredi refuse to serve in the Israel Defense Forces (IDF) or integrate into a wider Israeli society. The other theological possibility is that, if the Jews are recreating sovereignty in the Land of Israel, it is a sign that the messianic age is near. This view is the one accepted, over the decades, by more and more religious Zionists. Israel’s lightning victory in 1967 provided further evidence of the divine plan. So, too, did the opportunity to settle Judea and Samaria (the West Bank), the cradle of Jewish history and religion. Over time, the sector’s strong sense of political purpose led it to the right. This sense of purpose, even messianic purpose, also separated the national religious from Israel’s social mainstream. The geographical isolation of homogeneous national-religious communities on the West Bank ridge even set the political activists apart physically. Yet the dedicated political activity of the sector did not only separate it from the Israeli political mainstream but also helped to reshape it. The national religious camp became influential in politics, in the government bureaucracy, and in the military. Budgetary resources began to stream into the settlements from the political system, so much so that single settlements in the West Bank received more government-development funds than entire regions in Israel proper. Religious Zionism also succeeded culturally, to the extent that, according to a recent study by the respected Israel Democracy Institute, some 21 percent of Israeli Jews identify with the sector in terms of lifestyle and outlook, even if many of them are not themselves religiously observant. Far from being an outlier in Israeli society, the national religious sector gradually became a distinct pillar of the establishment. On one hand, then, the national religious sector has become more distant from mainstream Israel but, on the other, it has become more integrated into it. Confronting this paradox was Naftali Bennett. Bennett grew up in a religious Zionist household. In the army, he served in the elite Sayeret Matkal combat unit, the same unit that produced Benyamin Netanyahu and Ehud Barak. In adulthood, Bennett founded a high-tech start-up that sold for $145 million in 2005. Bennett then entered the political arena in earnest, serving as chief of staff for then-opposition leader Benyamin Netanyahu and head of the settlers’ lobby before being elected to head Bayit Yehudi. When Bennett took it over, Bayit Yehudi was a small, staid party with a handful of Knesset seats that catered exclusively to the core elements in the national religious camp. It chose to represent the sector faithfully but not necessarily to bring in Israelis from outside religious Zionism. Bennett had a different vision: as a young superstar of “Start-Up Nation,” he would use his high-tech street creed and personal charm to expand the party’s tent. Bennett would recruit into it less religiously observant—and even secular—Israelis. The party would retain its ideological and cultural core in the national religious camp but would also add supporters who could see the party as an alternative, attractive political option. Bennett’s political ally Ayelet Shaked, a secular resident of a fashionable north Tel Aviv neighborhood, exemplified the new approach and became a Bayit Yehudi icon. Bennett probably reasoned that his strategy could yield huge benefits for the national religious sector. Instead of walling itself off politically into a small, fringe party, the sector could gain immense political power. Bennett understood innately what the Israel Democracy Institute study later showed: many Israelis have an affinity for the national religious camp, even if they themselves are not part of its core. This group could be a natural target for Bayit Yehudi’s political expansion and could increase substantially the party’s Knesset representation. That would, in turn, enable the party to direct more budgetary resources towards the settlements and more spoils towards national religious institutions. In the 2013 elections, Bennett’s strategy succeeded. Bayit Yehudi increased its representation in the Knesset to twelve seats, up from four seats previously (or seven seats, if we include three from another religious party, some of whose elements Bennett took in). Heading into the 2015 campaign, Bayit Yehudi looked set to increase its representation still further. The first weeks of the campaign went according to Bennett’s strategic plan. In his first campaign video, Bennett dressed as a hipster and prowled the streets of Tel Aviv, mocking his political opponents for apologizing for sins he had not committed. In the second video, Bennett stars as himself, editing together clips of his craven political opponents cowering before the international media while he, Bennett, stands against them unapologetically. In the third video, those two secular ladies gush about their superstar Bennett and his grand deeds for the Israeli economy. But other parts of the national religious camp see things differently. They worked for decades to create independent institutions and communities, to keep other parts of Israel at bay. They voted for a party that was their party. Bennett’s freewheeling vision threatened this purist view. How could an expansionist, more pluralistic “Jewish Home” still be a home for the core of the national religious sector itself? That tension simmered for years, and, in January 2015, it boiled over. Bennett sought to reach out to so-called “traditional Mizrahi” voters, that is, Jews with family origins in the Middle East who are not fully secular but who are also not fully religiously observant. This sector accounts for a significant share of Israel’s population and, with its right-wing political views and its fondness for religious tradition, is another natural expansion for the Bennett coalition. Bennett announced he would add to Bayit Yehudi’s Knesset slate former football player Eli Ohana. A former star for the Beitar Jerusalem squad and longtime Likud activist, Ohana is strongly identified with traditional Mizrahim and is the perfect face for Bennett’s marketing. But fellow leaders and activists inside Bayit Yehudi were less convinced. Why was Ohana, whose career achievements were athletic, more qualified for the Knesset than others Bennett had passed by? How could a religious party put out Ohana as standard bearer when, by playing matches on Shabbat afternoon, Ohana had not only publicly violated the Shabbat but also caused hundreds of thousands of spectators and television viewers to do so as well? Some saw a more sinister prejudice at play: why should the national religious sector, dominated by Ashkenazim (Jews with family roots in Central and Eastern Europe), be turning to a lesser Mizrahi such as Ohana? Objections to Ohana’s nomination grew at the grassroots. After a few days, Ohana withdrew his candidacy, and Bennett backed down. The ditching of Ohana seems to have alienated traditional Mizrahim who might have considered voting for Bayit Yehudi. Still other voters seem to be defecting from Bayit Yehudi to a further-right alternative. Since the Ohana fiasco, Bennett has retrenched into a campaign aimed at shoring up his core national religious support. The longtime viability of his strategy for his party and his sector is, more than ever, an open question. Will the national religious sector continue its march into the Israeli mainstream, or will it reinforce its ideological and cultural purity? The answers to those questions will have a significant impact on Israeli society and politics.